Russian writers. Before they began to collaborate in the early 1950s, AS studied English and Japanese, and worked as a technical translator and editor, and BS was a computer mathematician at Pulkovo astronomical observatory. The brothers' first books made up an interplanetary cycle: Strana bagrovykh tuch [«The Country of Crimson Clouds»] (1959); Shest' spichek [«Six Matches»] (coll 1960); Put'na Amal'teiu (coll 1960), the lead novella of which was trans Leonid Kolesnikov as the title story of Destination: Amaltheia (anth 1962 USSR); Vozvrashchenie (Polden'. 22-i vek) (coll of linked stories 1962; exp to 22 stories vt Polden', XXII vek (Vozvrashchenie) 1967; trans Patrick L. MCGUIRE as Noon: 22nd Century 1978 US); and Stazhery (coll of linked stories 1962; trans Antonina W. Bouis as Space Apprentice 1982 US). This optimistic future HISTORY, set on or near Earth over a two-century period, espouses the romance of exploration and humanity's UTOPIAN thrust forward against the forces of Nature, and is acted out by believable vernacular heroes. A second phase soon began, in which utopian hopefulness did not survive unscathed. In «Dalekaia Raduga» (1963 Russia; trans Alan Myers as Far Rainbow 1967 USSR), history, with its pain, invades human existence through a physical catastrophe (which kills nearly all of the characters remaining alive from the first cycle). In Trudno byt' bogom (1964; trans Wendayne Ackerman from the German as Hard to be a God 1973 US) the darkness of history is — more directly — demonstrated on a feudal planet, where an observer from Earth finds it impossible to conclude that utopian intervention on his part will do any more than stun the world into a numbing dictatorship. But the unaltered world is dangerous and iniquitous, with premonitions of fascism and Stalinism clearly hinting to the visitor that, without intervention, huge tragedies will ensue. The successful marriage of vivid historical novel and sf makes this the brothers' paradigmatic early work. The book was filmed as TRUDNO BYT' BOGOM (1989). Far Rainbow later appeared, along with «Vtoroe nashestvie marsian» (1968) as Far Rainbow/The Second Invasion from Mars (coll trans Bouis [Far Rainbow] and Gary Kern [Second Invasion] 1979 US); the second tale is a Jonathan SWIFT-like masterpiece in which the INVASION is seen through the journal of a philistine who blindly registers the Martians' use of consumerism and conformity to transform humans into commodities. In this third phase, the brothers' darkening vision tended to express itself in VOLTAIRE-style FABULATIONS, where a formal mastery of expressionist plots cunningly exposed the societal bewilderment and growing bureaucratic sclerosis of their native Russia. In Ponedel'nik nachinaetsia v subbotu (1965; trans Leonid Renen as Monday Begins on Saturday 1977 US), folktale motifs are masterfully updated to embody in a dark picaresque the black and white MAGIC of modern alienated science and society. The sequel, Skazka o troike (1968 in a Russian magazine; 1972 Germany; trans Bouis as Tale of the Troika), which appeared with «Piknik na obochine» (1972 Avrora; trans Bouis as Roadside Picnic) in Roadside Picnic/Tale of the Troika (coll 1977 US), even more bleakly exposed the «scientifico-administrative» bureaucracy of the time. Roadside Picnic was turned by the brothers into 11 different scenarios for Andrei TARKOVSKY's STALKER (1979). The two stories, as published together in English, are an ideal introduction to this phase of their career. A final third-phase tale, Ulitka na sklone (part 1 in Ellinskii sekret [anth 1966] as «Kandid», part 2 1968 Baikal as «Pepper»; trans Alan Myers as The Snail on the Slope fixup 1980 US), is constructed as two interlocked stories set in an overpoweringly alien forest swamp; the two protagonists, Kandid and Pepper, respond differently to the world, the first in a «naive» stream of consciousness, the second in the guise of a Kafkaesque bureaucrat. The Kandid sequences are remarkably eloquent. 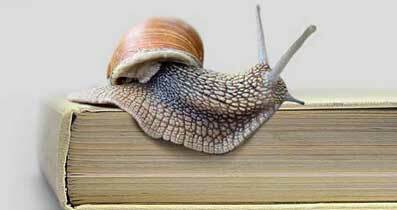 The overall title is an image of the uncertainties of knowing: humanity climbs towards knowledge as a snail climbs a mountain. A fourth and even more sombre phase begins with the Maxim Trilogy — Obitaemyi ostrov (1969-71; trans Helen Saltz Jacobson as Prisoners of Power 1978 US), «Zhuk v muraveinike» (1979-80 Znanie-sila; trans Bouis as Beetle in the Anthill 1980 US) and «Volney gasiat veter» (1985-6 Znanie-sila; trans Bouis as The Time Wanderers 1987 US) — in which the sometimes consoling glow of fable is stripped from abrupt and violent stories as the (at times) incongruously juvenile heroes confront scenes of increasing alienation and desperation. In Gadkie lebedi (1966-7 in a Russian magazine; 1972 Germany [edn disavowed]; trans A.E. and A. Nakhimovsky as THE UGLY SWANS 1979 US [also disavowed]; trans as Children of Rain c1987 USSR), the metaphysical swamp of The Snail on the Slope is transfigured into a mysterious fog which envelops Moscow, and which seems to engender all manner of intrusions. The fog is a signal of the death of the old world, and a highly dubious harbinger of a new: the children of the tale, justifying its title (a play on that of the famous fable by Hans Christian Andersen), seem to be entering into metamorphosis and a future which may (possibly) be bright. «Za milliard let do kontsa sveta» (1976-7 Znanie-sila; trans Bouis as Definitely Maybe: A Manuscript Discovered under Unusual Circumstances 1978 US) again combines fable and a bleak depiction of the social world as SCIENTISTS attempt (in a manner evocative of the work of Stanislaw LEM) to parse an implacably unknowable «force» which seems to be paralysing human progress. Their last works, published only in the glasnost period, were: Khromaia sud'ba [«Lame Destiny»] (fixup 1989), which intertwines THE UGLY SWANS with other material from 1986; Grad obrechennyi [«The Doomed City»] (written 1970-87; 1989), perhaps their weightiest work to date; and Otiagoshchennye zlom, ili sorok let spustia [«Burdened by Evil, or 40 Years After»] (1989), which was evocative of the work of Mikhail BULGAKOV. Over their career, the brothers moved from a comparatively sunny vision in which utopia could be aimed at in the NEAR FUTURE to a sense that the tensions between utopian ethics and the inscrutable overwhelmingness of stasis were in fact irresolvable. They became the best Soviet sf writers, legitimate continuers of a Russian tradition extending from Nikolai Gogol (> RUSSIA) and Shchedrin (Mikhail E. Saltykov [1826-1889]) to Vladimir MAYAKOVSKY and Yuri Olesha (1889-1960); and half a dozen of their novels, in their recognition that a people without cognitive ethics devolves into a predatory bestiary, approach major literature. 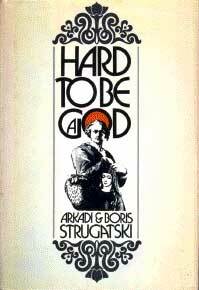 After the death of Arkady in 1991, it remained uncertain whether or not Boris would continue writing alone. Other works: Khishchnye veshchi veka (1965; trans Leonid Renen as The Final Circle of Paradise 1976 US); «Otel' 'U pogibshchego alpinista'» [«Hotel 'To the Lost Climber'» (1970 Iunost'), filmed in 1979 (vt Dead Mountaineer Hotel) and trans as <The Hotel of the Lost Alpinist> (a ghost title because the English-language publisher went out of business); Escape Attempt (coll trans 1982 US). As editors: The Molecular Cafe (anth 1968 Russia), ed anon. About the authors: «Criticism of the Strugatskii Brothers' Work» by Darko SUVIN, Canadian-American Slavic Studies #2 (Summer 1972); «The Literary Opus of the Strugatskii Brothers» by Suvin, Canadian-American Slavic Studies #3 (Fall 1974); «Future History, Soviet Style: The Work of the Strugatsky Brothers» by Patrick L. MCGUIRE, Critical Encounters #11 ed Tom Staicar; Soviet Fiction since Stalin: Science, Politics, and Literature (1986) by R.J. Marsh; The Second Marxian Invasion: The Fiction of the Strugatsky Brothers (1991) by Stephen W. Potts. See also: DISCOVERY AND INVENTION; GODS AND DEMONS; JUPITER; PHYSICS; POLITICS; SUPERMAN. // The Multimedia Encyclopedia of Science Fiction. Copyright 1995 by Grolier Electronic Publishing, Inc.
// The Encyclopedia of Science Fiction and updated text copyright 1993, 1995 by John Clute and Peter Nicholls.